This deliciously pleasing hot breakfast cereal recipe is great for those sensitive to dairy, gluten, corn, and soy. As an added benefit, when you travel you can mix up a batch of the dry ingredients ahead of time, add a bit of Rapadura (unrefined cane sugar), put it in a small container, and take it on the road. You can use the hotel coffee maker to brew hot water, pour it over the cereal, and let it cook for 10 minutes. 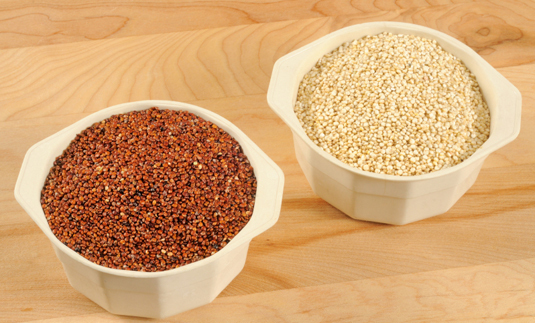 Red and white quinoa are actually seeds, not grain. Grind the rice, millet, and quinoa in a coffee/spice grinder or a sturdy blender. Mix ground grains with the nuts, dried blueberries, cinnamon, salt, and water. Bring to a boil and reduce heat to simmer. Cover and allow to simmer about 10 to 15 minutes, stirring occasionally and adding more water to create desired consistency. Add the milk, syrup, and butter as desired. You can substitute other dried fruit such as raisins or cherries for the dried blueberries. You can also use coconut milk for an extra creamy taste. Per serving: Calories 211; Fat 6.5 g (Saturated 1.5 g); Cholesterol 0.7 mg; Sodium 51 mg; Carbohydrate 32.9 g (Fiber 3.3 g); Protein 5.1 g; Sugar 12 g.